The call to priesthood is always said to be a call from God while the oil poured on the head of someone called to priesthood is the final religious ritual performed by a higher priest as directed by God just as it is written in the scripture. But the church and altar of God automatically turns into a political and business Centre when a naturally wild politician and a business man get into the church and use priesthood as a means to an end or cover his dirty personality/characteristics and when the issue is of such religion, the members and the masses are in great Danger. Today, this abuse and misuse of the altar and priesthood have gotten a higher ground in Africa, mainly in Nigeria. 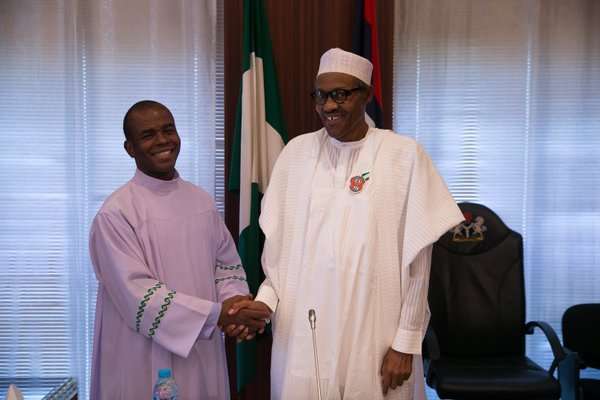 Is REVEREND FATHER EJIKE MBAKA TRUELY A PRIEST OF GOD? Recently, I saw that there is no need asking and pondering over same question over again because he in person have provided answers to that question through the words of his mouth and actions. Reverend Father Ejike Camillus Mbaka is not a priest rather he's a politician in the Catholic priesthood and everyone knows that. - Ejike Mbaka is the very person who called himself a priest but he haven't for one day condemned the killing of the masses by Fulani herdsmen just like other clerics do. - There have been killing of unarmed/peaceful protesters and Biafrans, instead of condemning such evil act, Father Ejike Camillus Anthony Ebenezer Mbaka opened his mouth and speak against those killed by the Nigeria government in other to receive brown envelopes from them as usual. Amidst all these deeds and actions, he still claims he is a priest. A priest who don't speak against and condemn the evil, injustice and inhumane treatments unleashed everyday on the congregation and masses rather he visits the government house after the incidents, smile, take pictures and collect money-stuffed envelope. Does a real priest of God possess and portray such ungodly character? Even the God whom he claim to be a priest to condemned evil that's why He sent arch Angel Michael to fight against it, Jesus Christ also spoke against evil, condemned injustice and evil or Does it I mean Reverend Father Ejike Mbaka haven't read those portion of the Bible since 1995 he got into the Catholic altar? When did the scripture state that a priest should focus on political issues, turn the priesthood and altar into a business empire, Speak/focus on selfish interests, overlook and abandon the pains/interest of the congregation and masses? If he or anyone still believe Ejike Mbaka is a priest; it is not of God but of the devil. I think the Catholic Church should run a test and check if this man they call a priest is still sane. And most importantly, they should tell him to stay away from Biafra restoration matters and focus on his business and politics. Through his words and actions, he is one of those encouraging Fulani herdsmen and the Nigeria government to Murder the masses and Biafrans. There is no atom of Christianity nor should spirit of God in Ejike Mbaka, the Catholic diocese take note. They have a business man and politician in the person of Mbaka, not a priest.